Rate this project Warren Willson has announced the availability of a bug-fix update of Puppy Linux, version 4.2.1: "This is a bug-fix update for Puppy Linux 4.2 and includes very few changes from the original release except for the following: CUPS 1.3.10 regressed from 1.4b2 to resolve ongoing issues with CUPS printing; fixed printing from Geany, Leafpad and Gnumeric using CUPS 1.3.10; AbiWord 2.6.3 with 2.6.6 plugins has been patched for improved .doc and .docx support (Liberation TTF fonts required for some documents); Pwidgets updated to 2.0.8; Pcrypt updated to 17 May 2009 release and now requires Ccrypt to function. MIME-types updated in Rox 2.6.1; patches for GTK+ Xinput and b43 Broadcom network driver; Pmusic updated to 0.6.4; Pschedule updated to 0.7. This release marks the end of my obligations as project coordinator for the 4.2 series of Puppy Linux." Read the rest of the release announcement for additional details. Download: puppy-4.2.1-k2.6.25.16-seamonkey.iso (100MB, MD5). The Puppy Linux project produces a lightweight distribution which includes many graphical utilities in a small download. The project's latest release is Puppy Linux 8.0 "BionicPup". A forum post lists the changes in 8.0: "Built with woofce using Ubuntu 18.04 Bionic Beaver packages and various .pet packages. All the usual packages (many updated) - Palemoon, DeadBeef, quickpet, pburn, JWM, change_kernels, Gnumeric, AbiWord, MPV, Samba, jwmdesk, Geany, Simple Ccreen Recorder, mtPaint, dunst, Transmission, pkg, uget, osmo etc. Some new stuff: woodenshoe-wis Rox filer. Rox now has copy and paste! Compton compositor set up as default. Adds subtle shadows to windows and menus. 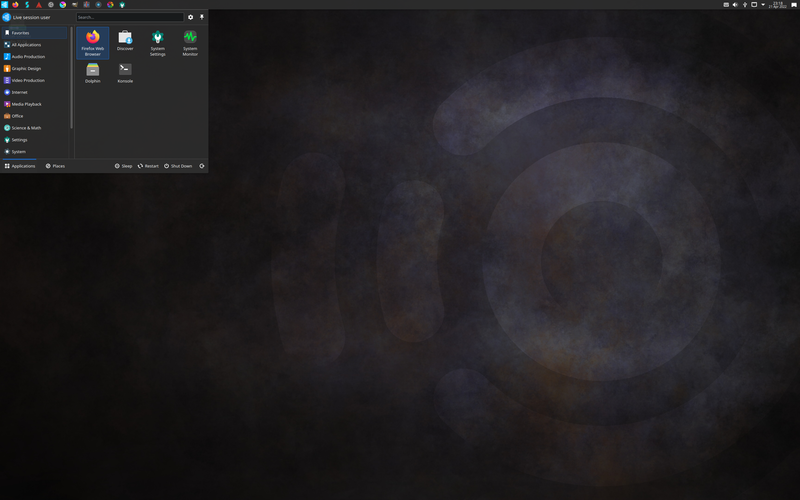 Matching JWM, GTK2 and GTK3 themes. Claws-mail now has a tray icon. Steps findnrun now default in tray. rg66 and geoffreys tweaked retrovol ffconvert, swapped for qwinff. Homebank is back. Sunfish chess, guvcview, redshift-gui, janky_BT bluetooth, gpick instead of gcolor, Take A Shot instead of Screeny." More information can be found through the project's release announcement. Download: bionicpup64-8.0-uefi.iso (354MB, MD5, pkglist). 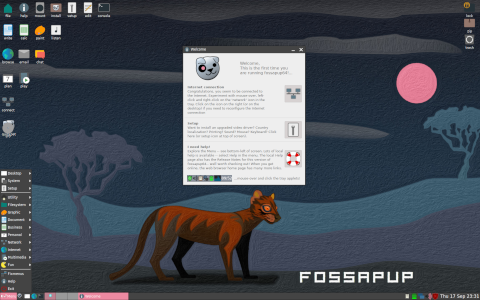 Philip Broughton has announced the release of a new version of Puppy Linux. The new version is Puppy Linux 7.5, code name "Xenialpup". The new version of the lightweight distribution is built using packages from Ubuntu's 16.04 "Xenial" release and Puppy maintains binary compatibility with Ubuntu packages. "Puppy Linux is small, runs in RAM, is lightning fast, very versatile and good fun! It has everything a novice will need while allowing full control to the experienced user. It comes in both 32-bit & 64-bit versions that can boot in both BIOS and UEFI enabled computers. The 32-bit version has kernel 4.4.95-noPAE for better compatibility with older hardware while the 64-bit has kernel 4.9.58 for better modern hardware support. True to Puppy Linux tradition both versions come with a full range of communications, productivity and entertainment applications as well as a wide range of the unique puppy-specific utilities and applications. The 330MB ISO includes: JWM window manager and ROX file manager. Palemoon browser and Claws mail client. FTP, torrent and chat applications. MPV media player, Simple Screen Recorder and Deadbeef audio player. Abiword word processor and Gnumeric spread sheet application." Further information can be found in the project's release announcement. Download links for 32-bit and 64-bit builds can be found on the project's home page. Download: xenialpup64-7.5-uefi.iso (330MB, SHA256, pkglist). 2015-11-17 Distribution Release: Puppy Linux 6.3 "Slacko"
Barry Kauler has announced the release of a new version of the Puppy Linux distribution. Puppy Linux provides users with a lightweight, installable live CD which strives to be easy to use. The new release, Puppy Linux 6.3, is built from Slackware packages and is available in 32-bit and 64-bit builds. "It has been awhile since the last announcement of an official release of Puppy Linux, 6.0.3 'Tahrpup', starting with 6.0 in October 2014. Mick Amadio, the coordinator for Puppy built from Slackware 14.1 binary packages, has brought Puppy to a new release, version 6.3. This is distinct from Puppy 6.0.x, which is built from Ubuntu Trusty Tahr binary packages, coordinated by Phil Broughton. Mick coordinated Puppy 5.7.x which is also built with Slackware packages. For the first time, Puppy is released in both 32-bit and 64-bit versions." Further information on the new Puppy Linux release can be found in the project's release announcement. There are also release notes for the 32-bit and 64-bit builds. Download: slacko64-6.3.0.iso (234MB, MD5). 2014-10-28 Distribution Release: Puppy Linux 6.0 "Tahrpup"
Barry Kauler has announced the release of Puppy Linux 6.0 "Tahrpup" edition, a minimalist distribution compatible with Ubuntu 14.04 binary packages: "We have another official Puppy Linux release. Since I retired from developing Puppy Linux early in 2014, keen members of the Puppy community forked my Woof Puppy builder, naming it woof-CE. Since then, 01micko has been active with a Puppy built from Slackware packages, named 'Slacko Puppy'. The guys have also been working on another pup, built from Ubuntu 'Trusty Tahr' binary packages, under the leadership of Phil Broughton and this has now reached release status. It is named 'Tahrpup' and is version 6.0. Tahrpup is an official release of Puppy Linux for those who would like the package manager to have compatibility with the large collection of packages in the Ubuntu repository." Here is the complete release announcement with relevant links. Download: tahr-6.0-CE_noPAE.iso (199MB, MD5), tahr-6.0-CE_PAE.iso (199MB, MD5). 2014-03-12 Distribution Release: Puppy Linux 5.7 "Slacko"
Puppy Linux 5.7 "Slacko" edition, a small and fast distribution built from and compatible with Slackware's binary packages, has been released as the "flagship" Puppy release. From the release announcement: "Slacko Puppy is built from a 'Puppy builder' system named Woof, which can build a Puppy Linux distribution from the binary packages of any other distro. There are many 'puppies' built with Woof, including Precise, Wary, Racy, and Slacko. A new release of Slacko Puppy Linux is out! Slacko Puppy is built from Slackware-14.0 binary TXZ packages, hence has binary compatibility with Slackware and access to the Slackware, Salix and Slacky package repositories. More comprehensive release notes and documentation of known issues are available. Slacko 5.7 is the first Puppy built from the woof-CE build system, forked from Barry Kauler's Woof late last year after he announced his retirement from Puppy development. It is the natural progression of Slacko 5.6 with the added features introduced to woof-CE." More links for readers to follow can be found on Barry Kauler's blog. Download: slacko-5.7-NO-pae.iso (161MB, MD5), slacko-5.7.0-PAE.iso (162MB, MD5). 2013-08-13 Distribution Release: Puppy Linux 5.6 "Slacko"
Puppy Linux 5.6 "Slacko" edition, a small and fast distribution built from and compatible with Slackware's binary packages, has been released: "This is an improved version of the successful Slacko 5.5. The biggest enhancement in this version is full support of the f2fs filesystem. Slacko 5.6 has many improvements due to the heavy development of the Woof build system and the many bugfixes to the Slacko base packages (independent from Woof). Lots of packages have been updated for the 5.6 series including but not limited to the following: improved SFS Manager, Updates Manager, improved graphics support, updated ffmpeg-2.0 and supporting programs including Pmusic and Mplayer, Abiword-2.9.4 and geany-1.23.1, Sylpheed-3.3.0, Firefox ESR, plus many other updated programs. Slacko 5.6 is available with a choice of kernels, 3.4.52 (with f2fs patch) compiled for processors that do not support PAE, and 3.10.5 for processors that do." Read the whole release announcement and find more on the homepage of Slacko Puppy. Download: slacko-5.6-4G-NON-PAE.iso (164MB, MD5), slacko-5.6-PAE.iso (165MB, MD5). 2013-07-28 Distribution Release: Puppy Linux 5.7 "Precise"
Bary Kauler has announced the release of Puppy Linux 5.7 "Precise" edition, a minimalist and fast distribution featuring the JWM window manager and compatible with Ubuntu 12.04 packages: "This is going to take everyone by surprise. I decided that 5.7beta2 is pretty good, so haven't bothered with an RC. Here is a short announcement. Another pup in the Precise series! This pup comes in two flavours, one for older hardware and/or those on dial-up Internet, the other for those with relatively modern hardware. The 'retro' flavour is an upgrade path for those who have used our 'Wary' Puppy, that targeted older PCs and analog modem dial-up - unlike most other Linux distributions, it continues to support a wide range of analog winmodems. It also has two web browsers, SeaMonkey and Opera, the latter preferred for PCs with less than 256 MB RAM." Read the rest of the release announcement and check out the more technical release notes for further information. Download (MD5): precise-5.7.iso (170MB), precise-5.7-retro.iso (200MB). 2013-05-21 Distribution Release: Puppy Linux 5.6 "Precise"
Bary Kauler has announced the release of Puppy Linux 5.6 "Precise" edition, a minimalist distribution and live CD featuring the JWM window manager and built from Ubuntu 12.04 binary packages: "It's out! Our latest and greatest Puppy. Relative to Precise Puppy 5.5, this latest pup brings some exciting new features, including a new X.Org video wizard (with forced-reboot recovery mechanism), new non-PAE 3.2.44 kernel with lots of analog modem drivers (making this an excellent pup for those still on dial-up Internet), many more applications internationalized, many applications upgraded, lots of bug fixes, and so on. Plus, a huge number of fixes and improvements at the infrastructure/system level. In all, a great new version of the Precise series." Read the release announcement and release notes for more information. Download the live CD image from the ibiblio.org repository: precise-5.6.iso (170MB, MD5). 2013-03-10 Distribution Release: Puppy Linux 5.5 "Precise"
Barry Kauler has announced the release of Puppy Linux 5.5 "Precise" edition, a small distribution built from and compatible with Ubuntu 12.04.2 binary packages: "Well, time marches on and Ubuntu have released their second build of 'Precise Pangolin', 12.04.2. Precise Puppy 5.5 is built from 12.04.2 DEBs, but of course it is extremely important to understand with Puppy Linux that our use of the binary packages of another distro is only a convenience for us, to obtain binary compatibility, hence compatibility with that distro's package repositories -- in all other respects, from the lowest levels of the infrastructure upward, Puppy is unique. There have been many bug fixes and improvements at the Woof level since Precise 5.4.3 was released, plus many package fixes and upgrades. Enough to warrant the number jump to 5.5." See the release announcement and release notes for additional details. Download the live CD image from ibiblio.org: precise-5.5.iso (168MB, MD5).